Samsung S5050 is another slider phone from Samsung which has been launched in February. The ultra-compact slider phone has been designed with girly characteristics like pink color for target to the ladies users. 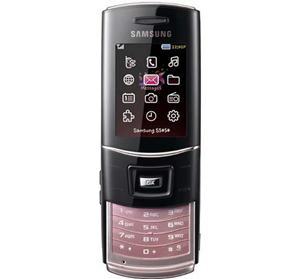 The phone is featured with an AMOLED QVGA screen with 320 x 240 resolutions. Along with a 3.2-megapixel auto-focus camera with LED flash, Samsung S5050 also supports Quad-band GSM/EDGE connectivity, has built-in FM radio with RDS, comes with 40MB of internal memory and 800 mAh battery. Additionally, it supports up to 8GB of microSDHC memory card and Bluetooth 2.0 with A2DP enabled. The Samsung S5050 with dimension of 105 x 49 x 14.6mm and weighs 102 grams is expected to be available in this summer with the price of $236.